Barcelona is the capital and largest city in Catalonia. It's located on the northeastern Mediterranean coast of Spain and it is a popular tourist destination for its interesting history, fascinating neighborhoods, and vibrant culture. The city has a unique mix of old and new, with historic buildings next to modern facilities. As a major tourist destination, there is no shortage of accommodation options throughout Barcelona. For budget travelers, hostels offer some of the most affordable places to stay. Most hostels also have shared kitchens available, which allow guests to prepare their own meals instead of eating in restaurants. 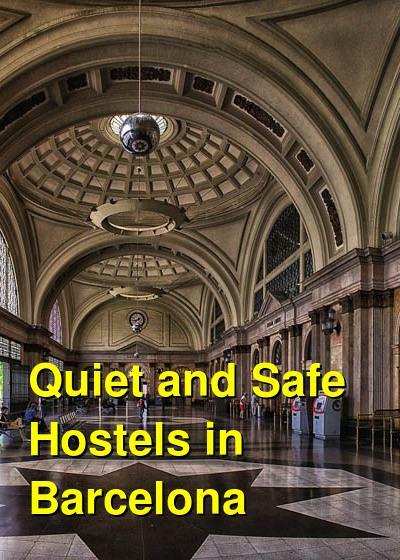 If you're looking for a quiet hostel in a safe neighborhood, then the options below are some of the best. A centrally located hostel in a safe neighborhood. Barcelona Central Garden is located about three block from Plaza Catalunya. It's a safe and friendly place to stay that is perfect for travelers who want an authentic experience in Barcelona. If you want to truly experience the city then this is a great option. There's a nice lounge area and a beautiful outdoor garden terrace. There's also a kitchen where you can prepare your own meals. While it's not hard to meet other travelers here, this is not a party hostel, and you should be able to get a good nights sleep. The staff here are travelers themselves and they do host social activities during the evenings. There are Flamenco and Tapas Nights and there are daytime tours and sightseeing activities that you can enjoy as well. This hostel is in a fun and safe part of the city. Guests can enjoy all kinds of amenities including lockers in the dorms, cable television, and laundry service. The hostel has twin, double, and triple private rooms. There are also four, five, and six bed dorms available. Both female only and co-ed dorms are available. An affordable hostel in a safe neighborhood. If you're hoping to enjoy a good nights sleep after a busy day exploring Barcelona, then Albergue Studio Hostel is a great option. It's located in a quiet and safe area that is just a few minutes away from the city center. 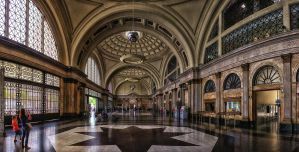 Within walking distance of the hostel you'll find grocery stores, banks, shops, restaurants, tapas bars, bakeries, and more. The hostel is very close to the metro station Reina Elisenda, which takes you to many of the tourist attractions in Barcelona. The football stadium is also just a half hour walk down the hill. They also provide guests with a free breakfast, free wi-fi, and a rooftop terrace where you can relax and soak up some sun. There's a small kitchen you can use to prepare basic meals, and there are security lockers available for guests staying in dorms. Many guests also enjoy hanging out in the television lounge or game room. A centrally located hostel that is great for solo and female travellers. Rodamon Barcelona is another great option in Barcelona for budget travelers. It's located in a renovated 20th century building that is right in the heart of the city. It's close to Gaudi's La Pedrera, Casa Batllo, and many different shops. The hostel has a very homey atmosphere that will immediately feel welcoming. They have both private rooms and dorms available. Private rooms include twins and doubles and dorms sleep four, six, eight, or ten people. Both co-ed and female only rooms are available. Each bed in the dorm has its own power outlet, reading light, and dark curtains that offer a little privacy. If you're looking for comfort, affordability, and a great location, then this is a good option. An affordable and centrally located guesthouse. Casa Consell is a guesthouse that offers comfort and affordability to budget travelers. The rooms are nice and tastefully decorated, the beds are comfortable, and the atmosphere is relaxed and friendly. Casa Consell is not really a hostel, but more of a guesthouse. It's located in a safe neighborhood in the middle of the Eixample and is beside the Paseo de Gracia. It's also just a ten minute walk from Gaudis unfinished Sagrada Familiar. This guesthouse has private rooms that include singles, doubles, three bed rooms, and four bed rooms. There are both ensuites and shared bathroom options available. If you're looking for a relaxing and friendly place to stay that is centrally located and affordable, then Casa Consell is a good option.